Epics are large chunks of work that deliver an important piece of functionality and value to end users. You can think of them as large User Stories – so large that they span multiple development cycles (e.g. Sprints). They are usually the first step in creating a product backlog. Epics allow you to capture the important elements of each major functionality, including the benefits it will deliver, the users you are building it for, and what kind of problem you are trying to solve for your users. At this stage, the level of details is not granular enough for a User Story. Instead, you can use this template to collect the information about your Epics, build your Epic backlog, and prioritize it using your favorite prioritization method. Download the Epic development form, and print as many copies as you need. 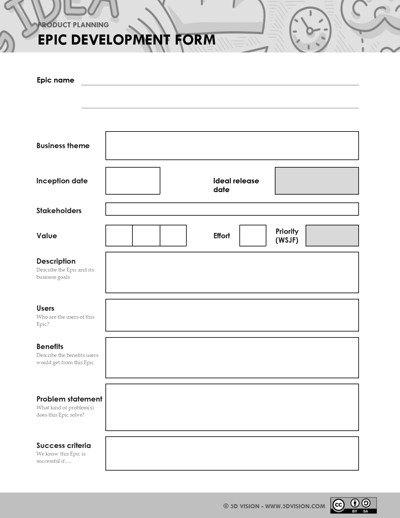 Use one form for each Epic you intend to research, plan or develop.